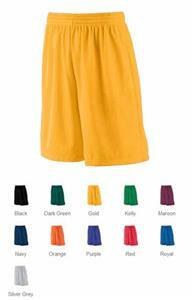 Augusta Youth Long Tricot Mesh Short/Tricot Lined Shorts. Outer layer of 100% polyester tricot mesh. Inner layer of 100% polyester tricot lining. Full-cut. Elastic waistband with inside drawcord. Double-needle hemmed bottom Top Selling Item. Waist (on half) 10 3/4" 11 1/4" 11 3/4 "
Hip (on half) 15 1/2" 17 1/2" 19 1/2"
Inseam 7" 7 1/2" 8"